Transformers 4 will be releasing in the summer of 2014 and there is a lot of speculation going on about what new would be in the offing this time. Transformers is perhaps not uniformly liked by all and sundry, however, the bottom line is that the Transformers franchise has not failed to entertain on a basic level with its gigantic alien robots fighting in bizarre situations. However in the upcoming Michael Bay’s Transformers installment next year, we would definitely have some cool cars lined up that will feature with the likes of Kelsey Grammer, Sophia Myles, Stanley Tucci, Li Bingbing and Mark Wahlberg. 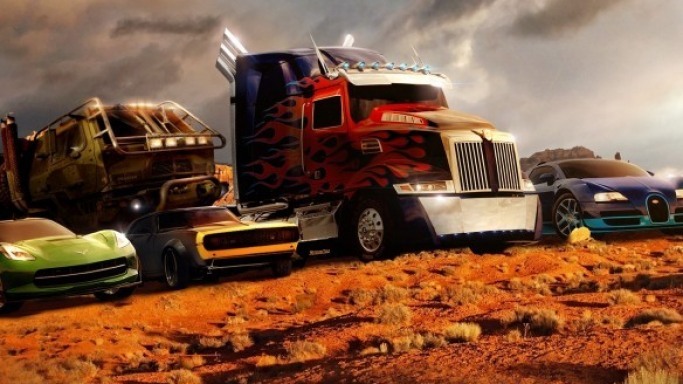 The promo of this sci-fi flick is surely going to contain a bevy of uber cool cars, here’s a sneak preview of what to expect: Optimus- the Optimus has undergone a makeover by incorporating the Western Star for the fresh look of the Autobots’ leader. Corvette Stingray- now this slick car that is styles on the sports vehicle by Chevrolet – the C7 Corvette Stingray- would be the look of the new character in the movie. Bugatti – The Bugatti Grand Sport Vitesse which is a $2.4 million beauty would be transforming into a huge robot- now that would perhaps have Jeremy Clarkson in tears! Hound – This rugged and sturdy vehicle from Oshosh Defence is another new entrant in the franchise. Sonic – The Sonic RS would add the element of fun amongst the bevy of cars. Lamborghini – The streamlined and sensuous 2013 Lamborghini Aventador LP is perhaps one of the coolest cars that would be a part of the line up. Pagani – The Pagani Huayra is a super fast vehicle which has its name from the Andean god of wind. Now this entrant will surely blow the audiences away! Freightliner Argosy – This big machine on wheels might just figure as the side kick or love interest of Optimus Prime. Bumblebee – This is the favorite out of all and might just be the surprise element in Transformers 4 with its new avatar which might either be a vintage 1967 look or perhaps the 2014 Concept Camaro. All in all, the upcoming Transformers edition has fans upbeat about the new cool cars- the new star cast of the film- which would be adding that element of fun and excitement. From the eye candy Bumblebee to the ‘yet to be launched’ 2014 Chevrolet Corvette Stingray- there is a lot to look forward to for the Transformer aficionados. Top Pick for Thieves – Luxury Cars!